Overnighting or overnight camping when bushwalking in Darling Range, near Perth, Western Australia. For many bushwalkers, the most satisfying walking involves backpacking over a number of days and camping out, to become immersed in the wilderness experience. The walk routes on WalkGPS are primarily intended as day walks, but there are also excellent designated campsites within, or close to, at least 18 of the walk routes on this site (listed below). Campsite location details are included on each of those walk pages of WalkGPS along with suggestions for overnight stays in the walk areas. The campsites are mostly Bibbulmun Track sleeping shelters. These may be used only where the walk routes include a significant section of the Track; Groups of 8 or more walkers cannot occupy a sleeping shelter at a Bibbulmun Track campsite until after 6pm. If you are planning an overnight or multi-day walk for a group of 8 or more walkers and plan to camp at the Bibbulmun Track shelters you should email a Notice of Intent to the Bibbulmun Track Foundation at least a month before your walk to help BTF avoid overcrowding at the campsites. There are no fees for use of these campsites and they cannot be booked. A standard DBCA fee applies for the Avon Valley National Park campsites. Opportunities for backpacking with overnight camping away from the designated campsites are currently very limited. Such camping has been banned throughout the extensive water catchment areas, which cover most of the 4500 sq km of forested region and walk areas of the Darling Range within the Perth region. Around 80% of the traditional bushwalking areas lie within the water catchments. 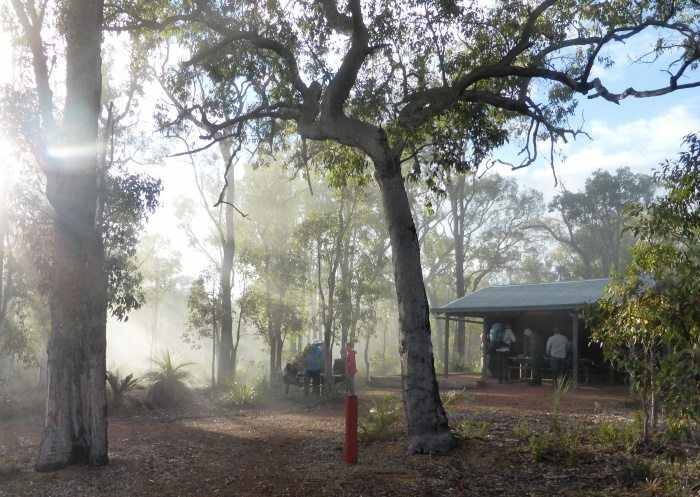 Camping for walkers is restricted to the designated campsites along the Bibbulmun Track between the Kalamunda Terminus and Dwellingup townsite. Within the larger part of these forest areas bushwalkers are therefore limited to day walks only. Abyssinia Rock Canning (Bibb. Track) Off route, 3.3km WSW of walk area. Avon Valley - Both Sides Homestead At start point. Avon Valley South Side Variation Bald Hill At start point. Darkin Ridge - Beraking Beraking On route, about half-way point. Dryandra Congelin Off route, 2.7km SW of walk area. Helena Valley (Glen Forrest) Hewett's Hill Off route, 3km SSW on track. Manns Gully - Chinamans Gully Helena (Bibb. Track) Off route, 1.1km SW of walk area. Mount Cooke Mt Cooke (Bibb. Track) On route, about half-way point. Mount Dale Mt Dale (Bibb. Track) On route, 2km before walk end. Mount Dale North Mt Dale (Bibb. Track) Off route, 2km south of start point. Mount Randall Monadnocks (Bibb. Track) On route, 3km east of start point. Mount Randall – Eagle Hill Monadnocks (Bibb. Track) On route, 3km east of start point. Mount Vincent – North Mount Cooke Mt Cooke (Bibb. Track) Off route, 2km SE of walk area. Murray River (Lane Poole Reserve) Murray (Bibb. Track) On route, about half-way point. North Dandalup Dandalup (Munda Biddi B.T.) On route, 4km after start point, or 4km before end point. North Ledge – South Ledge Hewett’s Hill (Bibb. Track) Off route, 700m west of half-way point. Three Mountains Monadnocks (Bibb. Track) On route, after first 5km of walk. Turtle Pool – Eagle Hill Canning (Bibb. Track) Off route, 5km NE of walk area.